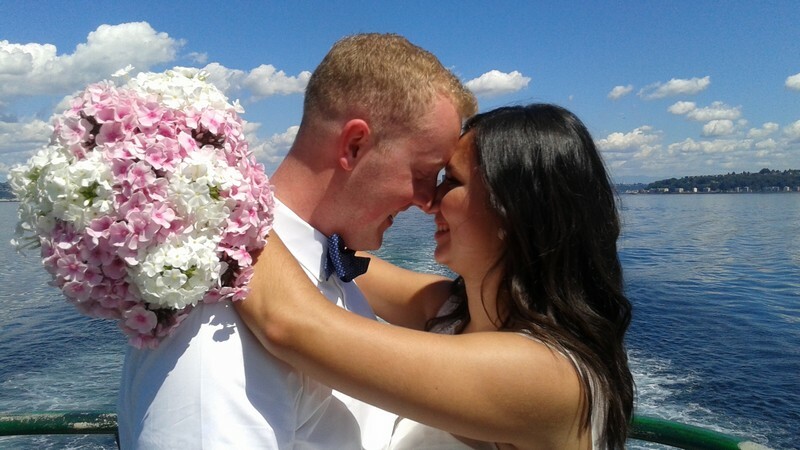 Mark and Lorena get married on the Washington State Ferry from Seattle. During this time of year, I invest a lot of heart and energy into very personal and robust wedding ceremonies – many of them hosting 60 to 150 people. So, it was such a lovely ‘time out’ from larger engagements to join Mark and Lorena (and hundreds of happy ferry going witnesses) for their wedding ceremony yesterday on the Seattle to Bainbridge Island run. The Washington State Ferry system offers one of the best “wedding deals” out there – call the Ferry System for permission to marry on board and the space and opportunity is no cost. With the backdrop of the Seattle skyline behind them, Mark and Lorena exchanged beautiful words on the back of the ferry, accompanied by 5 friends, their photographer (you must get a photographer for this! ), and hundreds of delighted ferry goers who were watching from several decks. Love, love and love a ferry wedding! MY fiancé, Terry, and I are looking for an officiant to facilitate a very small and simple ceremony on deck of the Bremerton to Seattle ferry. We will have our license in hand and witnesses on board (less than 5). Would like to do it during a Sat night run near or slightly after sunset, and of course on a clear night. We are currently looking at dates in October. We do have vows completed. Please let us know if this is something you would consider.